My daughter is just 16. And, although her dad is still reeling from the metamorphosis, it’s time for her to consider the options for further education once she graduates from high school in May of 2013. Although she was born in the U.S. and has lived there for the past twelve years, she’s entitled to Canadian citizenship. As such, she’s eligible to attend university there as if she’d lived there all her life. Her choices are legion, and she’s faced with (from my point of view) the daunting task of deciding where in the worlds she should go. When I was her age there was never a question where I would go (if I could gain admission)–the University of British Columbia. There was never any question where I’d go because it just wasn’t part of the culture in those dim days of the 1960s. UBC was a good school, and in the late 60s Simon Fraser University was a fledgling that had been rocked by the excesses of democracy taking root at places like Berkeley. As such, my establishment upbringing meant that SFU was, well, too radical to consider. As for the rest of Canada, which was a skating rink most of the year, it never occurred to me that there might be alternatives in the east. So, even though there are several thousand universities and colleges in the U.S. from which to choose, I mentioned to my daughter that she could also consider Canada. We formed a plan to spend a couple of days on her spring break to have a look at some of her options in my home and native land, and in the area I grew up [truly the best place on Earth–B.C.’s Lower Mainland]. I later discovered that my prima alma mater, UBC (B.A. English, 1976), is ranked 22nd in the world! Moreover, Simon Fraser (Honours B.A. Archaeology, 1987) was recently ranked first in Canada among ‘comprehensive’ universities. She could do a lot worse, I thought. But my daughter had her eye on smaller game. Through a friend at high school she’d learned about Quest University–the very new kid on the block in B.C. At the time it was just four years old, and had just graduated their first students. We flew to Seattle and drove across the border to Squamish. Next day we went on the tour. There were altogether three prospective students on the tour. All were, coincidentally, from the US. There is nothing usual about Quest. By almost any criteria it’s unique. For starters, it’s a private, non-profit school–the first of its kind in Canada. Its physical location is likewise off the beaten track. Ever heard of Squamish? You can be forgiven if you haven’t. It’s a small town about half way between Vancouver and Whistler–Blackcomb (where the 2010 Olympic Winter Games outdoor events were held). 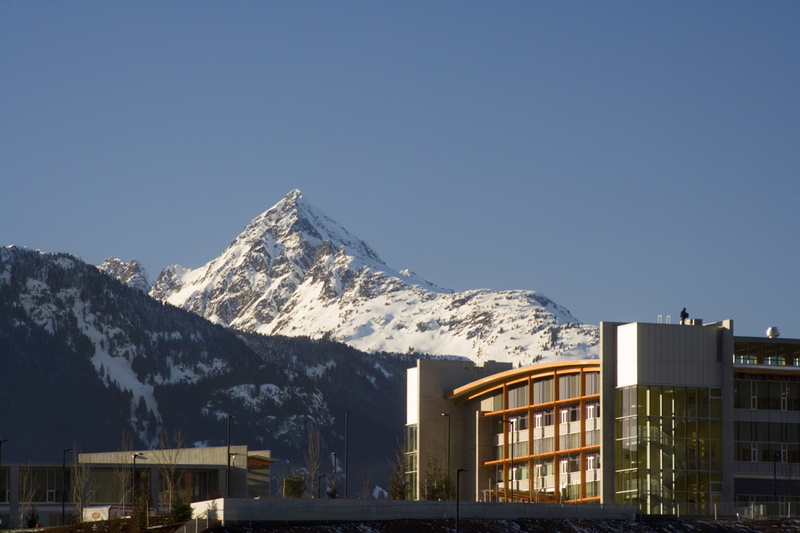 Quest received a private grant of land on the outskirts of Squamish to build their completely residential university. ‘Scuze me while I effuse a bit. The Quest Campus is compact, and comprises just a handful of buildings. The picture to the right shows the Library/Administration structure. It surrounds a three-story high atrium that’s a gathering place for the community. The student population presently stands at 350, and will never grow beyond 600. Everyone knows everyone else, and everyone watches out for everyone else. 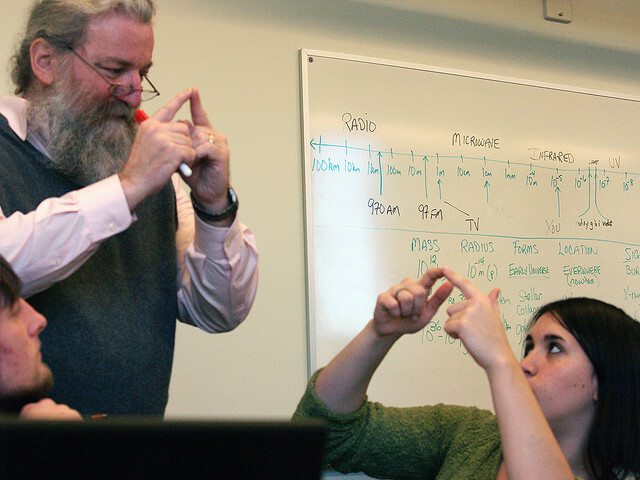 The instructors are Ph.D.s with a passion for teaching undergraduates. There’s no tenure–just rolling five-year assessments. They’re not required to do research. Quest’s student feedback is off the charts. Have a look. 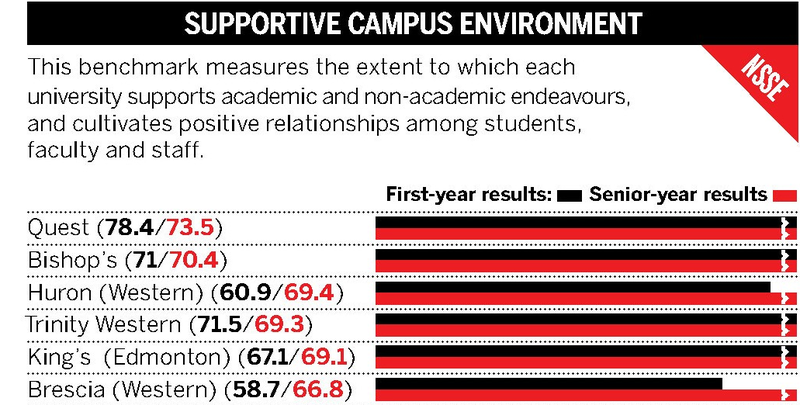 The National Survey of Student Engagement polls frosh and fourth-years at 751 Canadian and US universities and colleges. 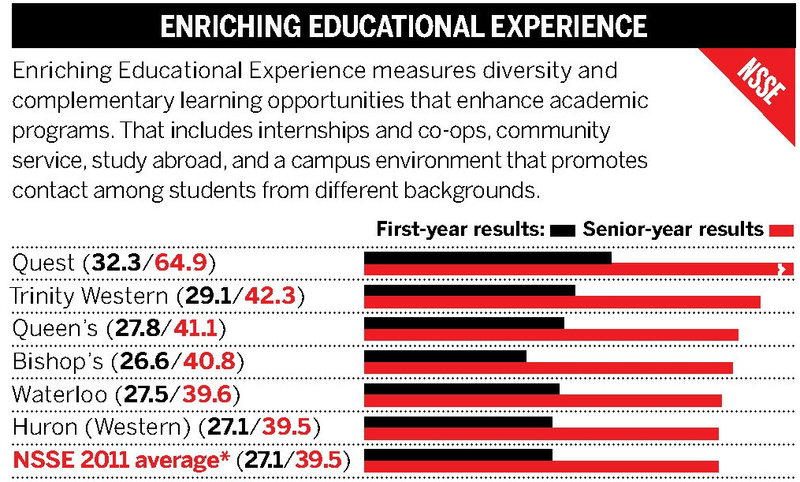 Quest topped the list of Canadian institutions in every category If student engagement represents learning opportunities, I think you know where I’d like my daughter to go. [Father’s only half-facetious worry showing–you don’t think they’re putting something in the water at Quest?] I’ve taken screen captures of the published tables and I’ve truncated the lists below the 67th percentile–averages shown include the US institutions. Sure. Sure. It’s easy to ‘engage’ when no class is larger than 20 students and the student to Tutor ratio is 12:1! Well, yes. That’s so. But Quest is doing it and many, many aren’t. At left is one of the founders of Quest (and its current president), Columbia University astronomer David Helfand, ‘engaging’ with students in one of the first-year classes he teaches. Earlier in his career he fought to have tenure abolished at Columbia. He won, but only for himself–he still undergoes the five-yearly reassessment that is now institutionalized at Quest. Oh, and did I mention Quest’s unique program? 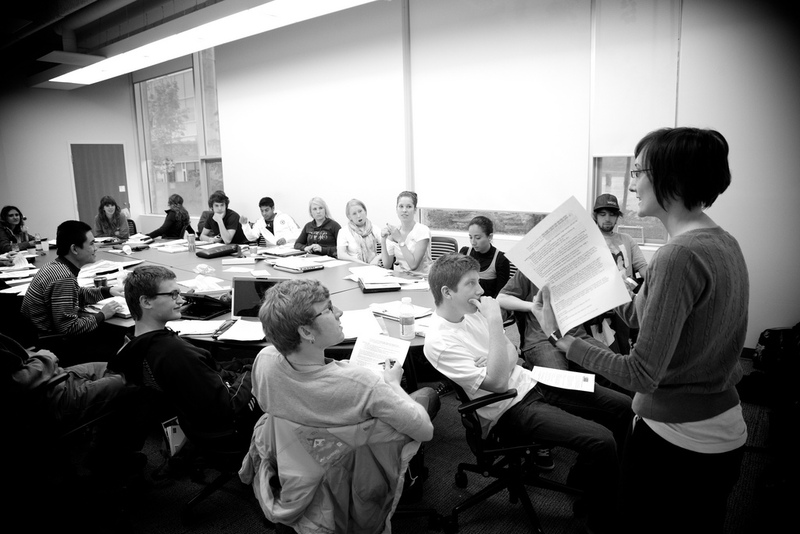 Students take one class at a time–about a month long. There are no academic departments. All classes are interdisciplinary and aimed at integrating knowledge with a global perspective. After two years students are expected to develop their own interdisciplinary ‘major’ by choosing a ‘question’ that they’ll investigate from every possible angle for the final two years, culminating with some form of ‘capstone’ project. Tutors are fully involved from start to finish. Students emerge with, by all accounts, a unique perspective. Funny, that. Well, I think I’ve probably bent your ear long enough for a Sunday night. I’ll prolly get back to you tomorrow with an update on my foreshortened look at the Younger Dryas Boundary impact hypothesis, etc. This entry was posted in Quest University. Bookmark the permalink. I commented on an idiotic blogspot blog of a very scared pseudoscientist. It works for me. And twenty years later high temperature superconductivity is still a contentious issue. If you can't stand the heat, then all I can suggest you do is get out of the kitchen, because inviting a paleontologist and archeologist to comment on what is basically hydrogeological phenomenon is not particularly helpful here. Your appeal to authority is noted.